Christmas Gifts - Handmade Gifts or Store Bought? « Do You Have ‘Rushing Woman’s Syndrome’? Have you started your Christmas shopping yet? I haven’t, but I’m starting to think of gift ideas and asking the yearly dilemma, to make gifts or to buy them? 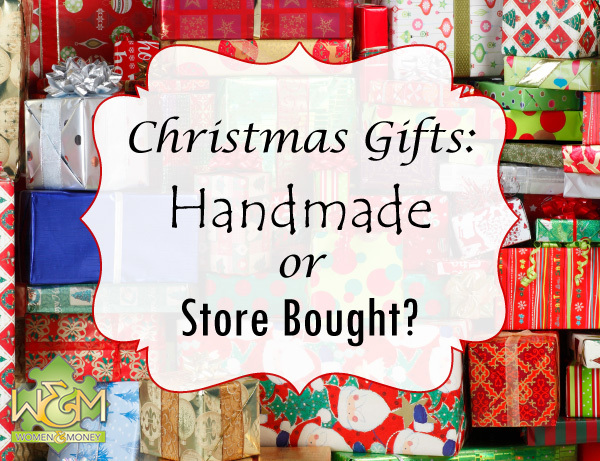 For me, this is an annual question which could go either way, some years I make gifts for family, other years I buy specific items or even gift cards if I’m really lazy busy stuck. If you are like me and thinking about making some gifts this year, let’s consider the pros and cons in terms of cost, time, and stress to help make our decision. Generally, people are able to save money by making gifts rather than buying. But you need to know the full cost of your handmade gift before committing to it so you definitely need to research first. Are there any special equipment required that you don’t already have? What is the best price for each ingredient/component that goes into making the gift? Can you reduce your per unit cost by making a bulk batch, and giving the same gift to multiple people? The next thing to keep in mind when it comes to cost, and I am guilty of this myself, is to assign the appropriate value to your handmade gift, not just your raw cost. What I mean by this is, don’t feel compelled to give extra gifts because you are undervaluing your handmade gift. When I made homemade liqueur for gifts, I paid a fair amount for the ingredients as well as the bottles, and it was just as good as the store bought version, but I still felt that I had not spent enough and so included other gifts along with the liqueur. In hindsight this was really not necessary and did not help me to save money. So value your time and effort, and give your gift the same value as a handmade item from Etsy or at least a factory made version from a store. This is not always the case, some handmade gifts can be very quick and actually take less time than shopping, especially if you are making a batch of the same handmade gift for multiple recipients. A friend of mine is a mother of young children, and she found that she had more time for homemade gifts than for shopping, because she was able to work on them at home in the evenings when her kids were in bed. She didn’t have to drag her kids to the mall with her and have a limited ability to focus on Christmas shopping. Of course, if you have some great gift ideas to buy, that may be quicker for you than researching handmade gifts, pricing and sourcing materials, and spending the time creating them. Be honest: do you like shopping for gifts? Do you like crafting or baking? Go with the method that will bring you more enjoyment and less stress. For me, shuffling through a crowded mall to find the perfect gift at the perfect price is definitely something to be avoided, and I end up wasting time and money on the travelling and food court. I enjoy baking and crafting, but if the craft or recipe is quite difficult or I am under a time crunch, it can be really stressful. If you decide to make handmade gifts this year, consider what your recipients will enjoy and also consider what you will enjoy creating and where your strengths are. If you are skilled in knitting or sewing, go with that. If you love to bake, embrace the baked goods gifts. Sharing your talent in a handmade gift is sure to be well-received and appreciated, as well as bringing less stress to you in the process. Well, have you decided yet??? Me neither. As I don’t have a lot of “store bought” gift ideas rolling around in my head, and am notoriously bad at coming up with ideas, I will start by checking out Etsy for handmade inspiration and Pinterest for plenty of DIY ideas and tutorials. Check out the Women and Money DIY gift ideas Pinterest board for what we found, and be sure to send us Pins of handmade gifts you like! PS. If you are looking for plenty of money saving tips for the Holiday Season, check out our awesome blog series Season of Savings with 14 tips to save money this Holiday Season. You might also like to grab our Christmas Gift List and Budget free printable. This entry was posted in Blog, Christmas, Women and Money and tagged DIY gifts, handmade Christmas gifts, homemade Christmas gifts. Bookmark the permalink. Both comments and trackbacks are currently closed.